L to R: Tony Mansfield, Liam Enright, Paddy McFlynn, Michael Fives, Johnny Radley. 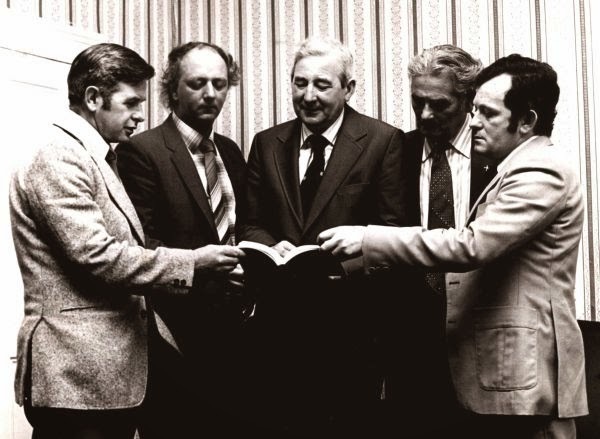 This week's photo shows club members with GAA President, Paddy McFlynn browsing the club's history book, Dún na Mainistreach / Baile na Cúirte: The Growth and Development of a GAA Club, launched in August 1980. The book, comprehensively researched, chronicles the activities of Abbeyside / Ballinacourty from before the club's official founding right up to the year of 1979.